The Educational Remix- At Odds With Copyright? Allow me to be frank- as busy as my world is right now, the requirement to read “Persepolis” by Marjane Satrapi was a very frustrating thing. With a stack of ten or twelve books with immediate professional impact to juggle -just waiting on my desk- this read seemed frivolous. The above clip is my version of a biographical “author introduction” for class. However, since the book itself is tightly autobiographical, it made little sense to parade an endless list of factoids in front of 18 adults who all read the same book… and at least a few of whom had Google in the pockets. The last tidbit to know here is that this is a graphic novel. Within the pages, the author allows beautifully stark images to tell a good amount of the tale alongside the words. It really is a masterful work about…… well, I’ll let you watch the clip and see. Rarely do I dive into the minutiae of the nuts and bolts of a creation like this. Sometimes I sort of ignorantly assume that others will analyze the creation of digital media by simply examining how it presents itself. Sat down with the cover of the book after reading and matched basic graphical elements to the style of the book using Adobe Photoshop. I wanted everything to “match” the book. Why? Don’t ask. I’m a sucker for design details like that. I’m weird. I know. I tried to match the colors, the fonts, and other subtle design elements present. Copied these design elements over into Keynote where I assembled all of the presentation materials as a traditional slide show. 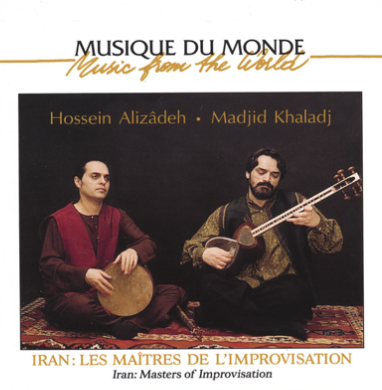 Trolled iTunes for a bit of Iranian contemporary folk music to use as a soundtrack. I know absolutely nothing about Iranian music. Therefore, I wanted to simply find a track that mirrored the stark simplicity of the novel itself. I think I found a good one. I like it quite a bit, really. Exported all slides as .jpg images into a folder on my desktop. This took less than a minute in total. Also- this conveniently numbered all images consecutively. Uploaded all images to Animoto.com. Because they were already arranged in slideshow-order, no further shuffling needed to be done. All that was left to do in Animoto was to select certain images to be “spotlighted,” followed by an upload of the .mp3 file for the soundtrack, and choose one of three overall presentation “speeds.” Animoto then does the rest. In the end, I felt like I created a pretty cool little video. It certainly took a bit of time to do as a first run, but was largely automatic once the original slideshow was completed in Keynote. Actually, this little clip made me so happy that, well… it almost makes me want to go back and re-read the novel. To be perfectly honest, Persepolis is a pretty special work of art. If you are new to this blog, you may think I have a exorbitant love for educational uses of video… especially this one little free online tool. In reality, while also juggling Lawrence Lessig’s Remix, a fascination with mashed-up content seems to be fresh on my mind. That, and a recent discussion of the read/write/remix culture of 2009 in Doug Johnson’s session on copyright at METC 2009 last week. In the Q&A afterwards I brought up an experience I had this past year regarding Animoto, UMG, YouTube and the YouTube content identification program. In fact, Doug recently published one of his latest “Fair Use Scenarios” on this very issue. I think we are starting to see some really creative resolutions to fresh new uses of content… that benefit all involved parties. Even this video contains most of a copyrighted song entitled: Passion by Hossein Alizadeh and Madjid Khaladj. Can readers of this blog download the song to an .mp3 later? No. Can they burn a copy of the song to play in a CD or DVD player? No. Is this educational use a mechanism to potentially generate more interest in the music as well as the book? I hope so. I wouldn’t highlight it if I didn’t think it held merit. I decided to post the clip here after I realized that this might be a really cool way for an instructor to build interest in a book that an entire class might soon read. (yes- like it or not, we still do this) In fact, perhaps this is a really good way for a media center specialist, or librarian to pimp a set of newly-acquired novels to prospective students. Perhaps it is even a way for students to reflect and then share a book with their classmates. (virtual booktalk?) I think this could be a really great student-to-student viral marketing tool for discovering new reading material. What do you think? Is this song repurposed to a reasonable degree? Does this use infringe upon the artist’s right to generate income from the song? Does this use in any way cast a negative light on the work? Is this kind of edu-marketing for students a reasonable educational use of the content? Please share your thoughts on these and any other questions you see fit. I teach at a school that has all the acronyms & labels one does not want associated with their learning environment: low performing (per state end-of-grade tests), low socio-economic w/70% free/reduced lunch, never met AYP, PBIS (Positive Behavioral Interventions & Support) due to high % of long-term suspensions) and SIOP (Sheltered Instruction Observation Protocol). The artist(s) will have greater exposure than he/she could ever have known. For once the chord is struck, there is no turning back. The student is hooked. @mlcreal, I agree with the fact that once a student is “hooked” the rest is easy. This is why I spend more time that the average person front-loading the content with efforts to connect to students in at least one way per kid… preferably more. I find that winning that first battle makes for a much smoother and more engaging classroom. Also- “Sheltered Instruction Observation Protocol?” I’m interested. Tell me more about this? I don’t know how to say this without sounding kind of over-the-top, so I’ll just go ahead. The video production you did here left me in silence with tears streaming down my face. Yeah, it’s the content, but much more that that, it’s seeing how creative a person can be; it models the heights I’d like to see my young students aspire to and eventually approach. Your work gives me a profound sense of hope regarding The Move we need to make in education, the move towards vastly heightened creativity, thoughtful synthesis, vibrant sharing. To me, your work represents an Ecology of Thought, a dance, a song, a visual poem. I am left, from watching your production and thinking about its gorgeous fluidity, thinking about the content, thinking about the form… I am left with a profound sense of joy in being human, knowing my fellow species members can create such wonders and share them. @connie weber, Wow. You are right about “over the top.” I’m not really sure what to say to that comment. I’m terribly flattered. An “ecology of thought?” You had to know that phrase alone would win me over. Reading your post just further drives home something I have championed for years… that is, the domain of emotions, the “affective” domain. This is something Benjamin Bloom was well aware of, and yet few folks have ever done a thing with this in comparison to the cognitive domain. The brain is far more than cognition. Emotions are too often thought of as a distraction to effective learning. In reality, the more you know about human physiology, the brain, neurochemistry, etc… the more you realize that linking anything with strong emotion in a careful and respectful manner is just good business in education. Emotions affect everything from awareness, and engagement on up to simple memory. Triggering emotions in a sloppy and random way is surely counterproductive. However, in careful doses it adds depth, color, and if nothing else, a reason to keep eyelids peeled. I guess it worked, huh?